Daily Physical Activity in Schools. Let’s Get a Move On! The following is a post by guest blogger Katherine Baker, Physical Education and Health Consultant at the English Montreal School Board. Long before the Ministry introduced Mesure 15023 – À l’école, on bouge! in the 2017-18 school year, it was clear that schools have an important role to play in the daily physical activity levels of children. The initiative in question distributed funding to 450 elementary schools across Quebec to support them in providing students with the opportunity to accumulate at least 60 minutes of physical activity each school day. The above excerpt from the Health and Well-Being Broad Area of Learning, published in 2001, highlights two critical points with regard to physical activity: the importance of daily movement, and the fact that it is the responsibility of the school as a whole to ensure students move enough during the day. Fast-forward 18 years and although we have a long way to go as an educational community before we can say that, as a whole, schools are an active place, we thankfully also have many examples of schools to look to as active school models and we also have an incredible amount of resources available to support schools in including more movement in the school day (see ParticipACTION’s 2018 Report Card on 2018 Physical Activity for Children and Youth, titled Canadian kids need to move more to boost their brain health as a start). Why include more movement into the school day? For starters, the answer includes an appreciation for the many ways that students – and everyone – can benefit from physical activity beyond just the oft-cited physical health benefits (which remain important, of course). The truth is, through almost any lens – whether it be physical health, cognitive functioning and learning, self-regulation, building community in the classroom and social skills development, developing physical literacy, or increasing levels of student engagement in learning – movement can help. Physical Health: 15-minute periods of school-wide moderate-to-vigorous physical activity each morning benefits cognitive functioning as well as physical health. Maximizing physical activity levels (and harmony) in the schoolyard is a focal point for many schools; between recess and lunch hour, the schoolyard is the place where over half of the active minutes at school will happen for most students. 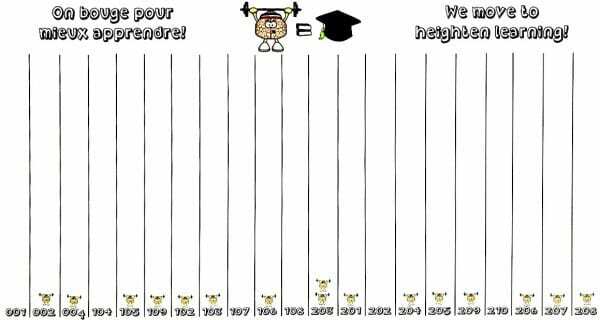 See Ma Cour, Un Monde de Plaisir , a comprehensive multi-step guide for analyzing and organizing school yards (english electronic version here). 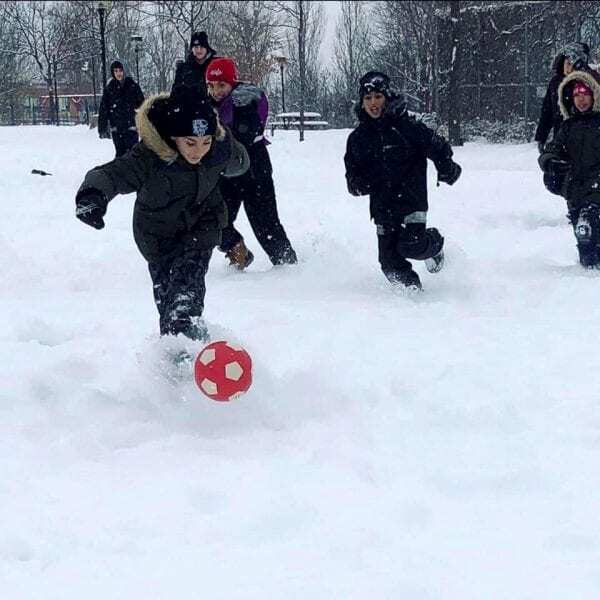 This is naturally accompanied by ensuring that recess time is a priority- see this 2017 Quebec publication The Essential Role of Recess in Children’s School Success and Health. Ensuring that students receive the minimum of 120 minutes of Physical Education and Health per week in an active setting and taught by a specialist is essential, as is ensuring that the Physical Education and Health program at the school is well supported (in terms of scheduling, funding, support for extra-curricular initiatives, not having a culture where students miss PE to make up work in other classes, etc.). Having more students walk to school through active transport initiatives (see Trottibus or the On Your Feet challenge) is a way that many schools build community while supporting the physical health of students. Given the number of hours and times-of-day that students spend in daycare, ensuring opportunities for physical activity during school-based daycare hours is also key. See the My Daycare is Physically Active/ Mon service de garde physiquement actif project. This project saw the creation of a series of six workshops for daycare educators to support the planning and inclusion of more physical activities into daycare programs (workshops among other topics address the supervision of physical activity- e.g. managing space, transitions, equipment, making teams, working with highly competitive students, safety considerations etc.- both in the gym, classroom spaces and winter/summer play outdoors). This resource is currently in the final stages of being reviewed for sharing province-wide. Cognitive Function and Learning: Physical activity in the morning (see video link above); movement breaks in the classroom to manage students’ states of attention/alertness; special projects like Projet MathSport de l’école secondaire Mont-Bleu. Self-Regulation: Hallway ‘energy stations’ where students who are having trouble focusing can ask their teacher for a pass to go to a station that houses equipment and/or instructions for physical activities for a set amount of time (using pre-set timers). See this example from Forest Hill Sr. (Lester B. Pearson School Board) and this profile on L’ecole de Paix in Repentigny for another example. Similarly, many schools have DeskCycles or stationary bikes in the classroom. Building Community and Social Skills Development: Movement can be used for many fun and engaging activities to build community in the classroom. In his book The Kinesthetic Classroom: Teaching and Learning Through Movement, Mike Kuczala dedicates an entire chapter on using movement for the purpose of developing class cohesion. Development of Physical Literacy: The more physically literate that students are, the more likely they are in a position to engage in opportunities for physical activity and to experience all the benefits that physical activity has to offer. Active Hallway initiatives provide students with fun ways to transition from class to class while developing their physical literacy. The Don’t Walk in the Hallway initiative originated in schools out west but many Quebec schools also now have active hallways. The Réseau du sport étudiant du Québec (RSEQ) actually sells active hallway decals, as does the Ever Active Schools organization in Alberta. Increasing Levels of Student Engagement in Learning: Teaching academic concepts through movement is a definite winner when it comes to increasing engagement in learning. Many teachers have gotten ideas for teaching math and language arts curriculum actively from Moving Education. Some schools use materials from Gopher Sport’s Active Academics line or Flaghouse’s Active Classroom Kit (warning – not cheap!) to incorporate more movement in the classroom. Similarly, for a ton of ideas, Mike Kuczala devotes a whole chapter to teaching new content as well as reviewing content through movement in his book. Teachers who have started using movement more in their instruction often comment that student engagement is one of the benefits they see the most readily. A personal favourite for reviewing content is an activity (from “The Kinesthetic Classroom” book) called Footloose, where questions are written on cue cards (1 question per cue card). Students each have a numbered answer sheet with spaces to answer each question. Sitting on chairs in a large circle – or staying at their desks – students must get up to exchange cards at a designated exchange point (center of a circle or other area of classroom if sitting at desks), and can only flip their card to look at the question once they have sat back down on their chair (strict rule: must return to seat and sit down before looking at the card!). Try this in your classroom and see how much movement it creates (especially when students sit down and look at the question only to realize they have already answered it, so they get back up to exchange then sit down again – lots of squats happening!). Making schools more active in the many different ways that are possible is actually the act of changing school culture. This article does a great job of summarizing some key elements to keep in mind when facing educational change. The way the initiative is introduced to school staff has also been a difference maker at many schools – the more involvement and input from staff, the better. Having little things that maintain momentum and motivation, like this schoolwide class activity tracker from East Hill Elementary (EMSB) or the organization of a Family Physical Activity Night helps solidify the message and keep momentum going, particularly during a period of culture change. There are so many reasons why more movement in the school day is the best move! Have fun exploring what it can bring to your teaching, your students, and your school! where these resources and others will be available!